Athena The Brain is an adorable, light take on Greek mythology. Athena has grown up as an orphan on Earth, living with her friend's family. She's always been different - smarter, better. Now she knows why. She's the daughter of Zeus! She is summoned to attend Mount Olympus Academy with all the other goddessgirls, godboys, and a few errant mortals. Athena's story is relatable to any girl who has started a new school. She's scared and excited. Even though she's brilliant, Hero-ology, Beast-ology and other classes are new to her. Plus, there's all these new people. Nice girls like Aphrodite, handsome boys like Poseidon, strange girls like Pandora, and mean girls like Medusa. Plus Zeus, her dad, can be just as difficult as he can be charming. This was such a fun book. It takes all the elements of Greek mythology that we all learn in school and turns it into a cute, fluffy story. I haven't studied Greek mythology since 6th grade and never really liked it that much, but I had no trouble keeping up with the characters and the stories. I especially enjoyed Pandora, whose incessant curiosity made her a nosy yet loveable character. I don't have any major problems with this book. It's meant for fun (and enjoyable education), so it's probably not going to be up for the Newbery prize, but that doesn't make the book any less worthy. The only thing I wish had been done differently was a better depiction of Athena's life prior to going to Mount Olympus Academy. The beginning threw her into the plot too quickly. But such a preface probably would have just added unnecessary pages and plot set-up, so I'm not too troubled. The story very loosely follows Homer's Iliad and Odyssey, two epic poems that I really liked in high school. The kids were playing with mortals in hero-ology and inadvertently create a huge conflict. It was fun to see how every little detail connected to Greek history and mythology. Learn the "real" idea behind the Trojan horse. The first Goddess Girl book is a quick, easy, light read. It's a must read for lovers of Greek mythology, but even people who have no particular affinity for it will find something to enjoy. I think it would be ideal as a co-read for students learning mythology in school. Check out all the Goddess Girls books! 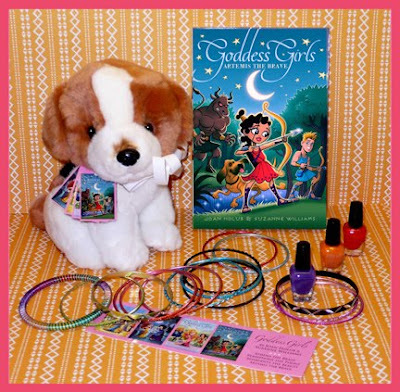 In honor of the recent release of the fourth book in the Goddess Girls series, Artemis The Brave, the authors Joan Holub and Suzanne Williams have graciously put together an awesome swag prize pack. I love your idea about using this in schools when kids are learning about Greek mythology. I was surprised at how many myth references there were. I enjoyed reading your review. Thanks! Hi thanks for the post. Its really very appreciable for learning school student. They can enjoy the story and as well as read about mythology. Really appreciable, thanks for the grate post. Your blog is so cute. It's like a much-needed breath of spring during this looong winter. I love your review of Athena the Brain! Thank you. Suzanne and I did have fun taking Greek myths and tweaking them to fit a school setting. The gameboard in Hero-ology class was a hoot for us to write. We just used it briefly again in the upcoming 6th GG book. We also crack ourselves up over Zeus sometimes. But the heart of the books are the friendships between the main goddess girls: Athena, Persephone, Aphrodite, and Artemis. Thanks also for hosting our Artemis the Brave giveaway! We're looking forward to sending the giveaway goodies pictured above to whoever wins on Valentine's Day! Hi Alison, Thanks for your nice review of Athena the Brain. We're excited to have another book about Athena debuting in April. In Athena the Wise, Heracles comes into the series and Athena must help him with his "Twelve Labors." I love your blog's anime theme. Someday I want to go to Japan too!And I noticed that you do cross stitch. I like doing the stamped version sometimes, but the counted kind takes more brain power than I have to give it! wow LOVE this review. the illustration on the cover makes me so happy. And thanks for this amazing giveaway! I haven't heard of the Goddess Girls stories before, but now I'm curious. They look adorable and fun... and I've always like Athena, so catching your review of this one was a good thing. By the way...here through the hop, and cruising around your blog. Happy weekend! I had no idea there were so many books out in this series already. I have the Aprodite and Athena books. My female students seem to really like these books. ** New follower from the book blog hop. oh wow.. thanks for the heads up! Too bad I can't participate but these are awesome books. Great Contest! My daughter loves mythology and has been wanting to read these, I had to enter for her. My daughter loves the Goddess Girl books. They have really got her interested in Greek mythology!